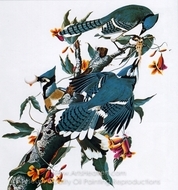 John James Audubon was an American ornithologist, naturalist, hunter, and painter. His father took him to Nantes, France to be raised by his wife, Anne Moynet. 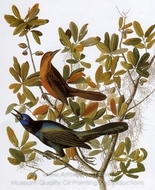 He was formally adopted in March 1789 and named Jean-Jacques Fougere Audubon, which he later Americanized. He was educated in Paris, where he took lessons from the French painter Jacques-Louis David. 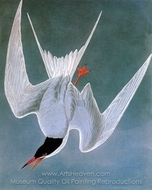 He painted, catalogued, and described the birds of North America. To draw or paint the birds, he shot them first, using fine shot to prevent them from being torn to pieces. He then used fixed wires to prop them up, restoring a natural position. 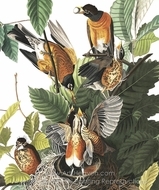 His paintings of birds are set true-to-life in their natural habitat. In Henderson, Kentucky, he is remembered by the 692-acre John James Audubon State Park. 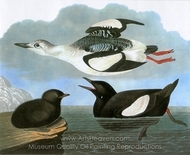 The Audubon Museum houses many of Audubon�s original watercolors, oils, engravings and personal memorabilia. The Nature Center features a wildlife observatory, which nurtures Audubon�s own love for nature and the great outdoors. The Park offers facilities for camping, hiking, fishing, swimming, golf, and tennis. In Natchez, Mississippi there is a gallery and, at one time, there was a tableau in the Natchez Pageant dedicated to him.